In rural Nova Scotia there are two absolutes of Summer. The first is rain on the weekends (or so it seems). The second is "strawberry suppers" proffered by rural churches, volunteer fire departments and other groups raising funds for their organizations. West Pubnico, an Acadian village on the south west of Nova Scotia (42 km from Yarmouth) is having theirs today, July 6. I think they're first off the mark this season. The U-Pick strawberry fields are open, which is where the berries for these suppers originate. Picking a few boxes for yourself is fun and can be a great memory for your family. 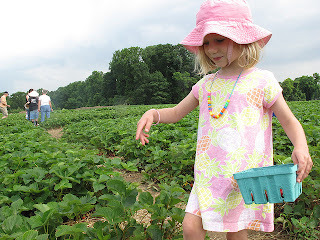 Being part of a crew to pick berries for a fundraising supper can be...tedious. I have done it. I sincerely hope she didn't get any strawberry juice on that dress. 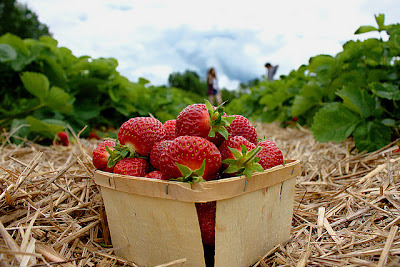 I know strawberry suppers happen in may other Provinces (and States) as well as Nova Scotia. All of them leave fond memories of home and community. The "main course" can vary by locale, but the staple of these affairs is a strawberry shortcake finale. Believe it or not, it’s easy to NOT hit the mark with this dessert. It seems like simplicity itself, but if you’ve ever made hockey puck biscuits you know what I say is true. 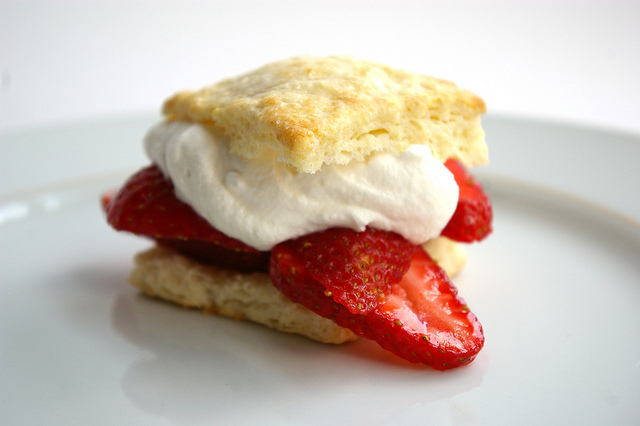 There are three secrets to fantastic strawberry shortcake. First, macerate your berries in sugar. Macerate means to soak. That usually means liquid, but in this case it’s sugar. Slice the ripe berries and toss with sugar. Be generous. Let the berries stand for about 1/2 to 1 hour at room temperature. Cold strawberries make sour strawberry shortcake. Secondly, don’t over handle your biscuit dough. This is great for all of us who are lazy. Over handling the dough makes the butter too small and homogenous and your biscuits turn out tough and not at all flaky. So remember, be lazy with your biscuit dough. This holds true for scones as well. The third, which isn’t really a requirement, is to replace the "plain" whipped cream with cream cheese whipped cream. This addition elevates the whole affair to another level. If you want true classic shortcakes just whip sweetened heavy cream. For a “nouveau” classic, add the cream cheese. You won’t regret it. By the way, fresh Nova Scotia strawberries are now available in our local groceries. They're about $2.99 per box, which isn't too bad. I expect the price to come down somewhat as the season continues. Remove the stems from the strawberries and slice. Sprinkle with sugar in a bowl, toss and let macerate at room temperature for 1/2 to 1 hour. To make the biscuits, combine the flour and baking powder in a food processor. Pulse to combine. Cut the butter into small cubes and add to the flour. Pulse until it resembles coarse crumbs or small peas. Remove to a bowl. Add the buttermilk (or kéfir) and mix with a fork. Working quickly with your hands combine into a mass. It will still be very rough. That is good. Take the dough and with floured hands press it out into a 9” x 9” square. Cut the biscuits into nine 3” x 3” squares. Bake for 15-20 minutes, or until they are golden brown on top. Let the biscuits cool on a rack for about 10 minutes. You may be surprised by the addition of the salt in the cream, but it helps bring out the sweetness. That's why it's included in homemade truffle ganache, glazes and the like. A "pinch" is how much you can grab between your thumb and index finger. Cook's consider it about 1/8 of a teaspoon. Split a biscuit in two, add some of the cream and then strawberries with some of the collected juice. Place the other half of the biscuit on top and then more cream and strawberries if desired. Some people do, others don't.